On our last day in London, we took it kind of easy as we had done almost everything that we wanted to do the days before. Our first stop of the day was at Granger & Co. for breakfast. It had been on my list of places to try for weeks, but sadly, I had not had a chance to do it yet! It's tucked into my neighborhood which was convenient for the next two stops after. Both Dad and I had the famous ricotta hotcakes complete with bananas and honeycomb syrup. It filled us up to get started with the sightseeing of the day! From there, we hopped on my bus (#23) and headed down to Kensal Road. I wanted to show my Dad where I lived as well as the neighborhood! Dad enjoyed seeing the building I live in as well as my flat. Our afternoon activity consisted of high tea at Harrods! 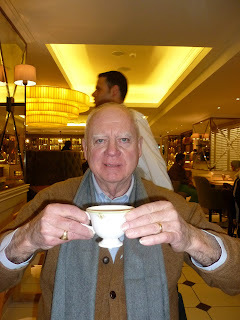 High tea is one of my favorite things to do in London, and doing it at Harrods has been on my list for quite some time. Dad has become quite the tea drinker on this trip, so we were both looking forward to listening to some classical music (including the Downton Abbey soundtrack) while eating the luxurious treats! While we took a break in the afternoon to pack and rest, we ended our evening with dinner at Bumpkin Notting Hill. Think traditional British food with a flair! It was a perfect ending to the four days spent together in the UK. Thank you! Please join via Google Connect to stay up-to-date with the latest advice.